I first purchased a season ticket in 2001, the season after we got relegated from the Premier League. At that point I thought the only way was up – with Bryan Richardson’s statement that it would be a ‘bit of fun’ playing against these lesser teams I was optimistic about watching Coventry win a few games (something I’d never really experienced) and was confident that within one or two seasons they’d find their way back up into the Premier League. I was sad at where we were but excited at the prospect of rejuvenation, disappointed but optimistic. Twelve years on I feel much the same, but not for footballing reasons. Friday is without question the most important day in the club’s history since 1987. Since the fateful day when Bryan Richardson decided that selling Highfield Road and therefore cleaving the club from it’s most important financial and structural asset, Friday has been coming. With one swipe of his pen he began the process which culminates on Friday when the club is more than likely to enter administration. The chain of events since that signature is well known to all Coventry fans, painful underachievement, poor management, suspect players and incompetent leadership. Up until a few weeks ago I didn’t really have a side in the ACL v SISU debate, I grudgingly respected SISU for saving us from administration in 2007 and I recognised that without the complex birth of ACL we would have been homeless. That changed a few days ago when I listened to Peter Knatchbull-Hugessen being interviewed on CWR, a man with a clear passion for Coventry City – a passion I have never heard or seen from any SISU ‘face’. To me there is a clear conclusion. However unpalatable their structure and however frustrating to have them push the club into administration, ACL are more interested in a sustainable future for Coventry City than SISU. Put simply, the core shareholders and day to day stakeholders in ACL will lose more sleep over Coventry City not existing than anyone (if there is anyone left) at SISU. People talk about the finance SISU have pumped into the club, granted this means they need the club to continue to stand any chance of ever seeing any percentage of that money returned to them. However, all the evidence suggests that after the rescue package they provided last season they were reaching the point where they would cut the chord and run away. Another year of accounts not being filed, more statements from Tim Fisher around having to persuade SISU to continue funding the club. When ACL state that they have moved for administration on the basis that they wish to prevent SISU being able to liquidate the club I believe them, for the simple reason that in doing so they are in effect writing off a large portion of the money they are owed (any settlement from an administration process will not be close to the full debt). To take such a drastic step, ACL and their CCC shareholders must have genuinely feared for the existence of the club and I applaud them for making a brave move. Friday excites me, I’m hoping it will be a seminal day in the rebirth of the club. A new, transparent ownership structure (with persons as yet unknown), a clear relationship with ACL, a path towards stadium ownership, the end to the cloak and dagger dealings of SISU. On reflection SISU have been a brutal combination of faceless incompetence. Bad ownership could be tolerated to a certain extent, as long as those responsible are willing to stand up in public and explain their decisions and justify their actions. Ken Bates is a prime example, a man many Leeds fans loathed, but at least they knew who he was. The fact that after five years I have no idea what Joy Seppala looks like in many ways sums up our owners and their motives. I hate the fact that I’m looking forward to my club going into administration, but after the past 24mths I cannot face any continuation with the way the club is currently run and the outright negativity which pervades every element. It’s frustrating that the good will and honest support of so many thousands of fans has been caught up in this saga, but the end is in sight. The Coventry City which emerges from the process can only be stronger than the one we have now, even with any prolonged legal battle and 10/15 point deduction. I’m disappointed we’re in this mess, but I’m excited about getting out of it. Despite having bought a ticket I decided to stay in a watch last night’s game of the tv. Not a fantastic match but an unbelievable final two minutes to take us through. Backed up by Mark Robins unequivocal statement that he was staying at the club and in fact it’s “in his blood” then surely it is day that will go down in Sky Blue history. The march to the arch is in on! Last Saturday afternoon saw me take the trip down the M1 to see my first away game of the season. A last minute decision based on the performances over the past couple of months and the fact that it’s our second closest trip. It goes without saying that the support was phenomenal and really did give me a sense of pride in the club and the fans, something I’ve missed when having a row of seats to myself in the South Stand of the Ricoh. There was the obligatory goading of the MK Dons fans, and in particular their non-existent ‘history’, the chant which really hit home to me was ‘We’re a proper football club’ sung briefly in the first half. Hearing that chant and seeing so many City fans so fervently enthusiastic for the team made me realise that whatever the outcome of our own ‘Fiscal Cliff’ involving ACL, SISU, Tim Fisher et al. the fire still burns brightly for CCFC. The depressing fact of modern day football is that fans now have to care deeply for both the on-field and off-field activities of the club, more so than at any other time in my football knowledge. I believe that fans can tolerate only one of these not being run successfully and showing progress. In other words, the thing that made last season so depressing was the failure on the pitch combined with the absolute chaos off it (Dulieu, Seppala, Brody etc). Currently we have big problems and questions regarding our owners and our lack of ownership of the Ricoh, but to a degree we can take that with the team performing so well and the confidence we have in Mark Robins. Equally if we had owners we were all confident in and had managed to solve the Ricoh ownership conundrum, but were still showing patchy form on the pitch, we’d probably take that as reassuring for next season as long as we could stay up. What will happen in the next few days and weeks regarding ACL is anyone’s guess, but however much bluster has come from both sides it’s clear that they both need each other to move forwards and have viable business models. My personal belief is that things will be sorted and a compromise struck, but the thing that has frustrated me the most has been SISU and the club’s lack of willingness to use an arbiter that the fans have confidence in, someone like Joe Elliott. ACL’s latest statement spoke of ‘Mayfair-based Hedge fund SISU’, a clear nod to the fact that they don’t feel they are dealing with Coventry City, they are dealing with a facade who are not acting fully in the best interests of Coventry City or indeed Coventry as a city. Currently the fans don’t have confidence in either side, we’re forced to choose between our football club or our council, both of which we have a vested interest in. It’s like Hulk Hogan taking on the Ultimate Warrior, there is no obvious bad guy so you’re left to just watch the spectacle unfold. If either the council or the club had asked someone like Joe Elliott (I appreciate this is complicated by the Hoffman issue) or another neutral personality, an ex-MP or indeed someone like Paul Fletcher who currently has no axe to grind, they could have worked with both sides to thrash out a deal and given the fans confidence that there was a ‘safe’ pair of hands working on the deal. Anyway, back to Saturday’s game. It was a great tactical performance from a settled side. The combination of grit, energy and guile from Jennings, Moussa and Fleck won the game for us. For so many years Coventry have never looked comfortable in possession away from home, we’re closed down quickly and the opposition get on top of us. Robins has changed this by doing two things, firstly implementing a solid, settled back four with energy at full-back, secondly having a five man midfield who know their role and are comfortable under pressure. Jennings to win the ball, Moussa and Fleck (Bailey) to retain possession and then feed the wide players, the supporting full-backs or look for a ball in behind. To a degree this is why I’m confident we can continue our good form even if David McGoldrick doesn’t stay, yes, he’s been fantastic in terms of finishing, but the formation and set-up Robins has implemented means any striker should be able to fit in. With Leon Clarke we may go more direct, but that should offer more opportunities for Backer, Sheffers and Moussa to pick up the second ball or go past Clarke, in contrast to now where McGoldrick is looking to run in behind himself. 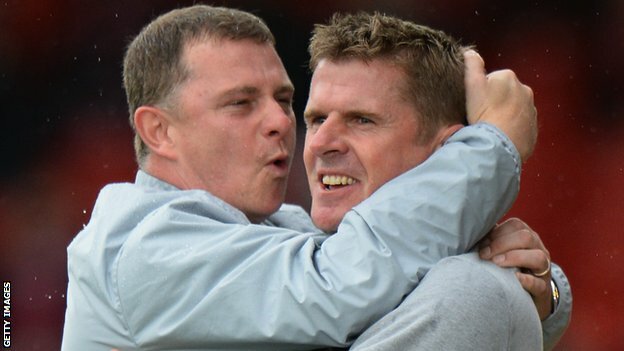 In conclusion, as we reach the end of 2012, we’re in the strongest position on the pitch in the past ten years, yes, a division lower than we should be but I’d argue our current squad and manager is the best we’ve had since the Mickey Adams days. If we can sort the Ricoh out sooner rather than later and keep the momentum going then you never know, 2013 might deliver some Sky Blue Smiles. So we’re three games into the season and it’s fair to say that we haven’t got off to the flying start which many hoped (and some laughably expected) we would do. A patchy performance at Dagenham in the League Cup, a below-par run out at Yeovil and then a nervous display at home against Sheffield United has lead many to see tomorrow’s game against Bury as a must win and those even more pessimistic to begin hovering dangerously over the panic button. My personal view is that I can’t think of three stranger opening fixtures we could have had to begin the season. With so many new players coming in, fans who have no experience of exactly ‘what’ League One is, a trip to one of the smaller grounds and teams for the league opener and a subsequent game against the other ‘big club’ in the division I believe we simply cannot draw any firm conclusions on where we stand. Tuesday’s game against the Blades was the first game I’ve seen and therefore my surmising of the first two games is purely by the commentary and comments from other fans, so I’ll concentrate on exactly what I saw. The first half did leave me worried that we were simply going to continue the disjointed and limp-wristed home games of last season, a more fluent and higher tempo second half gave me more hope and the fact that we now have two strikers off the mark is an encouraging sign. My fundamental worries from Tuesday come from the fact that we do clearly lack pace in the team, we still lack confidence on the ball and therefore give possession away cheaply and we still play too many long balls to our strikers who are not equipped to win much in the air. All of that said, a point against Sheffield United in the context of this league is a result all Coventry fans would have taken, the issue has purely been the context of the Yeovil game and to a lesser degree the performance at Dagenham. Last season I blogged that I would like to have seen Andy Thorn leave and Lee Carsley come in, purely to give us a better chance of attacking League One with a squad that still includes many young players. Now I’m not going to join those who are calling for Thorn to leave now – the tail-end of last season or the summer break was the time to make that change – we have Thorn in place and must therefore allow him to show whether he can build momentum and points in League One. But what if he doesn’t? I had an interesting chat with a City fan on Twitter at the weekend around whether the parroted ‘give him 10 games’ is enough to get a true sense of whether we stand a chance of challenging at the end of the season. He didn’t think 10 games was enough, I maintained my gut-feel that it was. Given the fact that gut-feel tends to end up being indigestion I decided to do some digging into the numbers on past League One standings after ten games compared to the end of the season. The conclusion is that broadly speaking ten games gives you an average view within ten points (either way) of your points total at the end of the season. So the rule I am currently working to is that if after ten games our extrapolated points total plus an extra ten points (let’s try and be optimistic that our form will improve through the season) positions us on an average playoff points total then Thorn still has my backing, if not then I think that’s enough time to begin looking at our options either inside or outside of the club.